Pick up a hard copy the Farm to Table Report at any of the Heirloom Farmers Markets starting November 11th. • Keeping It Local For The Holidays • What does heirloom mean, anyway? The holidays are a great time to come together around a heartwarming meal and celebrate the people who bring joy and meaning to our lives. For many of us, those people are our local farmers: the men and women who dedicate their lives to planting, growing, and – eventually – harvesting food to sustain and nourish their community. This year, you can support and celebrate them when you use local produce to feed the friends and family you invite to gather around your table. Whether you’re cooking for two or twenty, using local ingredients in your holiday dishes is easy when you buy from farmers and producers at Heirloom Farmers Markets. With a wide selection of late fall and early winter vegetables–starchy winter squash, dark leafy greens, hearty root vegetables, and citrus–the market is a wonderful place to find inspiration for a feast. For a true taste of home, fill your plate with ruffles of white Russian kale, heartwarming green chile tamales, caramelized roasted root vegetables, fall-off-the-bone pasture raised meat, and maybe even a slice of homemade pumpkin pie. To help keep your loved ones healthy this holiday season, follow the lead of Anne Loftfield, Owner and Farmer of High Energy Agriculture. Loftfield contributes a variety of vegetable dishes to her family’s holiday get-togethers. “I make sure that everyone fills two-thirds of their plates with vegetables,” she says with a smile and a wink. With staples like steamed broccoli, kale salad adorned with fruit, and winter squash casserole – all made using produce Loftfield grows with love but without any herbicides or pesticides – her family is happy to oblige. “Our bodies are tuned to seasonal eating,” Loftfield says, recommending that cooks look for produce and meat grown close to home for a healthy and delicious meal. Eating locally can be sweet, especially when it comes to seasonal pies made from local ingredients. Kathy Robbs, of Robbs Family Farm, always arrives at her family’s cozy barn Thanksgiving bearing homemade pie. Rather than reaching for canned pie filling, Robbs uses homegrown heirloom squash to make honey and molasses -sweetened pumpkin pies for the whole family. While a pie pumpkin would work just fine, Robbs recommends using an heirloom squash variety like a blue hubbard for its “sweet, dense, and bright-orange flesh.” If pumpkin isn’t your thing, fill your holiday pies with another local treasure: apples. Arizona apples tend to be smaller than most, but they pack a punch when it comes to flavor. Purchase a few pounds of locally grown apples from Dwight and Carla English of English Family Fruit Farm before heading home for a satisfying afternoon of peeling, slicing, rolling, and crimping. Your hard work will be rewarded with a warm slice of apple pie, and smiles from all of those you share it with. If your family celebrates Christmas, you might try keeping alive the age-old tradition of putting an orange in each family member’s stocking. While there are many explanations for how this sweet custom came to be, we like to believe that the many segments that make up an orange illustrate the ability we all have to share with others. The lovely variety of oranges from Desert Treasures Orange Groves present wonderful opportunities for sharing local citrus. 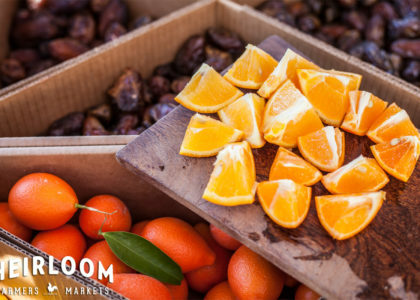 Tucson’s only remaining orange and date groves grow everything from navel and mandarin oranges to diller oranges: a sweet and tangy variety of Arizona sweet oranges. Desert Treasures will begin to sell their lemons, grapefruit, and oranges in December. Stop by their market booth to chat with Chris Duggan and find the perfect orange for your snacking, juicing, and stocking needs. With citrus as delicious as that grown in southern Arizona, everyone will be happy to receive one of these local treasures as a gift. If your family isn’t attached to tradition, allow the local harvest to inspire something new at this year’s holiday meal. When Sleeping Frog Farms began raising hogs, farmer Laurel Goslin was inspired to replace her traditional Thanksgiving turkey with local pork. Alongside a pie made with Tohono O’odham Ha:l squash and a big side of greens, Goslin’s Thanksgiving meal is more like the food that was eaten at the first Thanksgiving than a can of cranberry sauce will ever be. Sleeping Frog Farms’ cold season harvest – a bounty of greens, cauliflower, broccoli, radishes, turnips, carrots, and beets – is sure to satisfy both traditionalists and those who wish to break out of the mold. There’s no better way to celebrate our land, our neighbors, and each other than by sharing a meal made with locally grown food. Whether you make a pie, side dish, or meal with the goods you get from Heirloom Farmers Markets, you will be supporting local producers and strengthening our foodshed – and that’s worth celebrating! Plus, check out our upcoming ‘Holidays at the Markets‘ event from December 12 – 16, to find that special foodie and artisan gift for everyone on your list! What Does Heirloom Mean, Anyway? The term “heirloom” can be used to describe a lot of things: a piece of jewelry passed down for generations; your favorite Tucson farmers markets; and many of the vegetables grown by our local farmers. “Technically, an heirloom seed is one that hasn’t been modified for at least 100 years,” says Miguel Quijada of Wild Child Gardens. Although not everyone agrees that it takes 100 years for a plant to become an heirloom, heirloom seeds are collected from the best plants year after year, over time increasing their viability and strength. High Energy Agriculture’s Anne Loftfield accredits the superior flavor of heirloom produce to the fact that their seeds are developed naturally. “Humans didn’t have their hands in it, and humans are the ones that keep messing it all up,” she explains, referring to genetically modified seeds used by many farmers in the U.S. and elsewhere. “I wouldn’t grow anything unless it was from an heirloom seed,” says Quijada, whose wife and fellow farmer, Maria, has been saving seeds since she was five years old. Using heirloom seeds that have naturally adapted to the hot and dry growing conditions in the desert is especially useful. The carefully selected heirloom seeds that the Quijadas plant at Wild Child Gardens produce crops that are more resistant to drought and heat than non-heirloom varieties. Farmers also appreciate the fact that they can save their own seeds from heirloom plants, which saves them money and gives them more control over the taste and quality of their crops. “There are a lot more varieties than you can even believe,” says Kathy Robbs, who grows many different heirloom vegetables, including accurately named peanut pumpkins and spiky African horned melons, at Robbs Family Farm. By choosing to grow heirloom produce, our local farmers are preserving plant diversity, saving money, and giving us the opportunity to try unique varieties of produce that we can’t often find in conventional grocery stores. 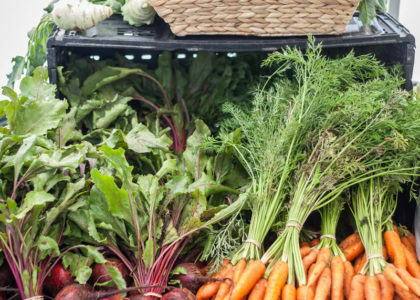 With so many local farmers and food producers in once place, the Rillito Park Farmers Market presents the perfect opportunity for visitors to learn more about local food and nutrition. Each week Heirloom Farmers Markets’ newest education program, Taste of the Market (TotM), will provide fun activities and presentations to help customers learn about local food and purchasing resources that make it easier to support local, eat healthy, and cook delicious meals at home. “By engaging visitors in an educational experience, including a taste test of fresh foods, TotM empowers individuals to choose foods that nourish their bodies while supporting small-scale local agriculture and local food producers,” says Jackie Mendelson, Program Coordinator of TotM. Sponsored by Arizona Complete Health, Taste of the Market will create fun and exciting ways for people to learn about everything the market has to offer. Through engaging learning activities like seasonal samplings and games, everyone will have the opportunity to learn more about healthy eating and supporting local producers. Check out all of the fun that Taste of the Market has to offer at the Healthy Living Expo at the Farmers Market at Rillito Park Farmers Market on November 11 from 9am to 1pm, as well as every week thereafter.